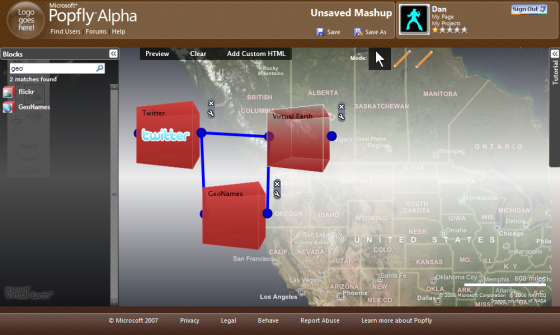 Microsoft will announce the private beta launch of Popfly this morning, a new Silverlight application that allows users to create mashups, widgets and other applications using a very cool and easy to use web-based graphical interface. We previously covered the launch of Yahoo Pipes and compared five different applications that let you mix data and build applications online. At the time we mentioned how this space was really heating up – and how Pipes from Yahoo simplified the creation of mashups and mini-applications by providing a drag+drop interface. Microsoft are the latest entrants in this market, and they have completely leapfrogged every other application we have seen so far. Popfly is a big leap forward from the competitors above because it lets you do so much more, and it is one of the nicest web application interfaces I have ever seen. With Popfly, you can create applications, mashups, web pages and widgets (gadgets) and it is all tied together in a social network (as part of the Live Spaces platform) where you can connect with other users and publishers of applications. Mashups are created by dragging in and connecting ‘blocks’ which produce an output. Blocks are modules that connect to various web services API’s, and even today there are dozens of different blocks that work with a whole variety of different web services. See additional screen shots and a link to a screencast on the Popfly overview page here. Seeing applications like Popfly coming out of Microsoft is something that I couldn’t have imagined all too long ago – and together with the recent Silverlight announcements (which we were also very excited about) the new Microsoft is really starting to come out through their product releases. Popfly so far seems to be another potential big hit from the new Microsoft under Ray Ozzie (Ozziesoft). Invites: While the private beta is very limited (even within Microsoft), we do have TEN invitations to send out. Leave a comment about how you would use Popfly and the best (or funniest) ten will be sent an invitation to the application.